The world's biological diversity faces unprecedented threats, and the urgent challenge facing the concerned biologist is to understand ecological processes well enough to maintain their functioning in the face of pressures resulting from human population growth. Perhaps the best hope for the future lies in sustainable development, where both the intrinsic value of the natural world and the importance of the services it provides are acknowledged, and the rate at which resources are utilised does not lead to a long-term decline in biological diversity. Developing an understanding of the scientific and cultural issues facing those seeking to promote the conservation or restoration of species and habitat provides a major challenge to us all. 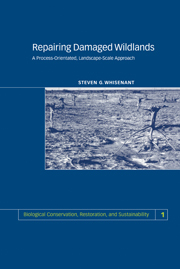 Those concerned with biological conservation and restoration need skills not only in biological disciplines, but also in the political, social, historical, economic and legal framework within which conservation practice must be developed. Books in this series will therefore, wherever possible, consider the issues from a broad perspective, looking at practical managerial aspects, as well as the applied science of conservation and restoration.